One of our featured brands is Amerock Hardware. They have been around since 1929 and have created decorative hardware solutions that inspire their customers style throughout the home. 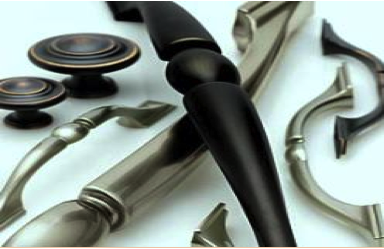 Amerock offers a complete line of decorative cabinet hardware that not only looks beautiful but is functional. Amerock hardware has a reputation for their chic designs. Amerock offers so many different styles to fit anyone’s design needs. One of the styles Amerock offers is their Contemporary & Traditional Collections. If you are looking for modern functionality with a bold and simplistic design this collection may be for you. The sleek and sophisticated design of the Bar Pulls Collection makes a statement with clean lines and smooth textures. The Amerock BP19010SS Bar Pulls 3in(76mm) Center-to-Center Pull is finished in Stainless Steel. Another beautiful collection Plumbtile carries is Amerock Transitional & Eclectic Collections. This collection is a fusion of art and a hand-crafted design with unique eclectic finishes. This collection will make your kitchen or bath stand out amongst all others. The Amerock BP29340G10 Candler 1-1/4in(32mm) Length Knob is finished in Satin Nickel. Some tips to help you install your new Amerock hardware are important. The first step is deciding your location. The best place to put your cabinets hardware would be abut 3″-4″ above the upper non-hinged corner on base cabinets, or the lower non-hinged corner on wall cabinets. Once you have decided your location you will want to drill a hole for the knob or pull. When drilling for a knob or pull, a 3/16″ hole is recommended for most styles. If you are using a pull, you will want to determine the hole center spacing of the pull. 3″ hole centers are the most common. Amerock offers a wide variety of sizes so you may want to check before drilling. Also, it is important to make a template prior to any drilling. This will ensure the placement is the same on all cabinets and drawers. If you have any questions one of our experts at Plumbtile is waiting to assist you.